Do you know that Chingay Parade is a uniquely Singapore way of driving away evil spirits during Lunar New Year? Traditionally, fire crackers were used, but as they are banned in Singapore, Chingay Parade (with all its noise and merriment) was used as a replacement to compensate for the lack of customary New Year practice. I’ve always know about the origin of the use of Chinese fire-crackers, but I didn’t know that the first formal Chingay Parade was started for that reason! Chingay Parade was mooted in 1973 by the then-Prime Minister Lee Kuan Yew who was also the chairman of the People’s Association (PA). This year, PA has provided some sneak peeks to let everyone experience Chingay’s grandiose and multi-cultural performances at Suntec City and Bugis+! So prior the actual parade (on 7th/8th Feb), I had the opportunity to get a rare sneak preview during their “On the Go! Chingay 2014” event at Suntec City last weekend. Alas, not only was I not feeling well on that day, my SD card was corrupted and all the photos taken from the camera was gone (Should have just trusted my iPhone instead). So I decided to make another trip down today to take some photos again, this time, at Bugis+ instead so that I can share them with everyone! The word Chingay is equivalent to the Mandarin zhuang yi (妆艺), which means “the art of costume and masquerade” in the Hokkien dialect. During the preview at Suntec, there were 2 God of Fortune (Cai Shen Ye) throwing out gold and taking photos with shoppers. During the On the Go! 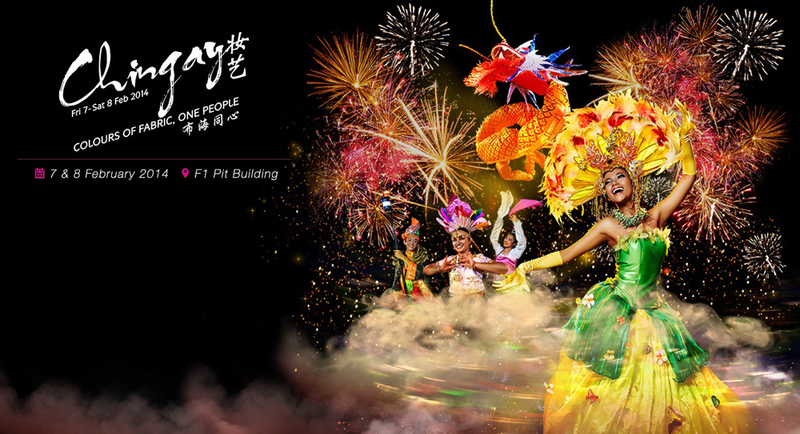 Chingay 2014 events, previews of performances of the beautiful Chinese Dance 俏花旦 (Qiao Hua Dan), Bollywood Dance, Malay Dance and Children’s Ballroom Dance were shown. There was even a surprise performance by the senior citizens of the Sembawang Gardening Interest Group, making use of wheel barrows and plants and costumes to interact with the audience. Some of the dances are so entertaining that you would have the urge to rush in and join them! If I have to choose, these giant puppets are definitely on my top list! Four metre tall, these puppets are supported by three people, and they definitely don’t look light! Xiao Ming and Mei Li (left) the couple puppets did a cute hug together while San San the giant Gangnam-Style dancing lady (right) did a cute gangnam style dance on the streets. I can’t wait to see the actual performance by 30 of these giant puppets representing the local ethnic groups and professions such as hawkers and cabbies during the parade! This year’s parade is the grandest ever parade, having approximately 70,000 individuals (almost double of 2013) involved in the parade to welcome the Year of Horse. – Showcase of a 360 meter Batik Fabric that will flow through the entire Parade route accompanied by colourful multi-cultural performers. These tapestries are hand-knitted by volunteers out of recycled fabrics such as t-shirts and pillow cases. Constituency volunteers from Taman Jurong have spent up to three hours each day for the past three months crocheting and knitting the donated cloth into colourful pieces of artwork. The knitting of the tapestries is very symbolic of people of different backgrounds coming together. This year’s theme, “Colours of Fabric, One People” will be reflected in both the tapestries and the official song “Knit As One (网织同心) composed by renown local music talent Mr Lee Si Song, with words by Jay Lim, the tune features local singers Hazrul Nizam, Ric Liu, Serene Koong and Vicknesvari Vadivalagan singing in Singapore’s four official languages – English, Chinese, Malay and Tamil. Parade 1 (7 February 2014): Category 1 at $50; Category 2 at $40. Parade 2 (8 February 2014): Category 1 at $60; Category 2 at $50. Like the Chingay Facebook Page to receive latest updates about the annual event!